Adrian Benepe has worked for nearly thirty years protecting and enhancing New York City's natural and historic beauty. He has continued this effort as commissioner of the Department of Parks & Recreation since his appointment by Mayor Michael R. Bloomberg in 2002. 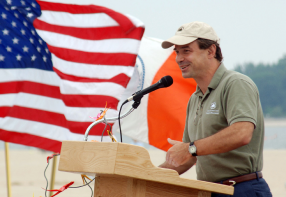 In this role he has focused on improving park facilities and programs for children, developing new waterfront parks and greenways, and making New York City bloom with millions of new flowers and hundred of gardens. Commissioner Benepe oversees the operation of over 29,000 acres and nearly 4,000 properties including almost 1,000 playgrounds, 600 ballfields, 550 tennis courts, 63 swimming pools, 35 recreation centers, 14 miles of beach, five major stadiums, and 2.5 million street and park trees. Mac Griswold, a journalist, garden historian, and gardener, has been writing about landscape subjects since 1987, producing books and articles that look at gardens primarily as cultural documents. Her first book, Pleasures of the Garden, examines the Metropolitan Museum’s garden-related artworks. Her second, The Golden Age of American Gardens, written with Eleanor Weller, studies the “Country Place Era” (1890 to 1940). Washington's Gardens at Mount Vernon: Landscape of the Inner Man explores the Founding Father’s character through the lens of his gardens, landscape, and farm. The director of archival research at Sylvester Manor on Shelter Island in New York, Griswold is currently writing Slaves in the Attic, Rediscovering a Long Island Plantation, a book based on the manor’s rich collection of the papers that she inventoried and arranged to have catalogued at New York University.